Avid readers of children’s literature surely remember Stuart Little’s trim appearance — his dapper suit, fedora, walking stick, and most of all his self-assured expression as he turns back to glance at the reader. Another reader might remember a pipe-smoking Mr. Dog, whose battered straw hat and bow tie belie the rambunctious canine within. Others will remember the features of the Laura Ingalls Wilder family, right down to the friendly demeanor of Jack the brindle dog. A clear image of Wilbur, porcine friend to Charlotte, the wisest of spiders, endures. Yet we often treasure all these representations without remembering the extraordinary artist whose pencil nudged them to life — Garth Williams, who died two decades ago on May 8, 1996. Born April 16, 1912, in New York City, Williams became a highly popular and successful American illustrator during what many consider to be the golden age of children’s literature. Yet it is difficult to state that he belonged to America, since he often lived abroad — in England as a young man, in Italy, briefly, and, later, in Mexico. Nor did he initially embrace his vocation as an illustrator. Following in the footsteps of his artistic parents, he experienced early success at the Royal College of Art in London, winning the British Prix de Rome for sculpture. But the Second World War interrupted his career. Williams arrived in New York just before the attack on Pearl Harbor. Setting up a photography studio on West 16th Street, he once exhibited ink-wash drawings in a gallery also featuring the work of Mark Rothko, whose style had not yet evolved into his signature abstract expressionism. Eventually Williams found work as an illustrator for The New Yorker, where serendipity brought him to Ursula Nordstrom of Harper and Row, then a highly influential editor of children’s literature. Williams won the commission to illustrate a new story by E. B. White, beating out eight other accomplished artists, one of whom imagined Stuart Little in a zoot suit. 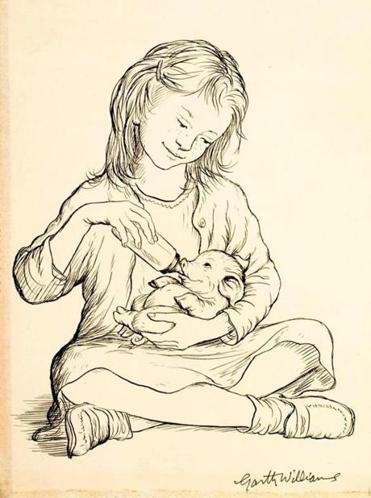 In addition to the locations of Stuart Little and Laura Ingalls Wilder, Williams drew the world of “Charlotte’s Web.” He later claimed that he tried to see everything with the eyes of the author, but he once imagined Charlotte, though drawn accurately as an “aranea cavatica,” with a Mona Lisa face. White demurred, and Williams removed the face, leaving only two dots to suggest eyes. Indeed, at a time when Disney’s animations weren’t quite animals or people, Williams humanized the animal and animalized the human. His Stuart Little was both a convincing animal specimen and a believably diminutive gentleman: He was challenged by the physical size of the human world yet capable of deep ratiocination. Similarly, the endearing protagonists of George Selden’s classic “The Cricket in Time’s Square” — Tucker Mouse, Harry the Cat, and Chester Cricket — straddle the line between human and animal. Dominated by their creature appetites, they nonetheless display the lively, knowing expressions of men about town. Over the course of his career, Williams did illustrations for many well-known and well-beloved children’s writers, including Margaret Wise Brown, Russell Hoban, Randall Jarrell, Margery Sharp, and Jack Prelutsky. He also worked for the Golden Book series, producing such classics as “Baby Animals” and “The Little Counting Book.” Williams’s own tale about the union of black and white rabbits, “The Rabbit’s Wedding” in 1958, was famously mistaken to promote interracial marriage, but it is clear he never intended a political message. Family reports from Williams’s later years in Mexico describe a man who lamented the great artist he never became. Yet, in his own way, Williams left a longer lasting cultural imprint on subsequent generations than did more critically successful contemporary artists. At a time of rapid suburbanization, his drawings nourished our need to maintain an intimate, ongoing relation with the animal world. His illustrations of our pioneer times, evoking a vanished agrarian lifestyle, still furnish the deepest impressions of a uniquely American past. Twenty years after his death, we still owe him a debt of gratitude. Elizabeth K. Wallace is the author, with James D. Wallace, of “Garth Williams, American Illustrator: A Life.” She is also a professor of English at Boston College.